In this day when Christians and churches are widely dispersed throughout the world, the ques- tion 'Who is the church?' could easily be dismissed as irrelevant. In this publication, Bishop David Zac Niringiye pleads that as Jesus warned, we should not be in haste to conclude that any community with religious titles or forms and who speaks the right language of 'Lord, Lord ... ' is authentic church. Taking his cue from Hebrews 11 and 12 the author addresses the motif of 'the people of God', looking first at the ancient people of Israel, beginning with Moses, then the new Israel and the covenant in Christ, born through the Holy Spirit at Pentecost and finally the life of the new community, the church, during the apostolic era. Through this biblical journey it is made clear that as the pilgrim people of God and the new community in Christ we must be marked by faith, love and hope, looking forward to the full consummation of the kingdom of God - justice, peace and joy, fully realized when 'the new heaven and the new earth where righteousness dwells' (2 Peter 3:13) is inaugurated. 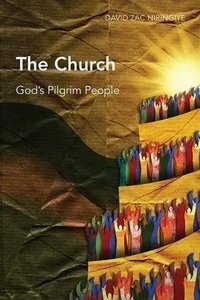 About "Church, The: God's Pilgrim People (Global Christian Library Series)"
Order now to secure your copy when our stock arrives. Other edition is available. 9781844745494 0 Available. Expected to ship in 5 to 6 weeks from Australia. Order now to secure your copy when our stock arrives. Other edition is available. 9781844745364 0 Available. Expected to ship in 5 to 6 weeks from Australia.